No matter how you make beef stew in a crock pot, it winds up tasting the same every time. Even if you try different seasonings or vegetables, the beef flavor tends to cover up the flavor of everything else. Smoking the beef stew meat before putting it in the crock pot will enhance the flavor of the beef and change the dynamic of this classic dish. And, since this recipe starts out with cubed beef stew pieces, the smoking time is relatively small compared to our other smoked beef recipes. Light your smoker and put your crock pot on low to give them 30 minutes or so to get up to temperature. Put beef broth, beef stew seasonings, and veggies in the crock pot. Season your beef stew meat with salt and pepper and throw it on the smoker in a foil pan with enough beer to line the bottom of the pan but not enough to submerge the entire beef. If you overfill the pan the smoke flavor will not penetrate the beef. 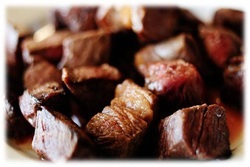 It is best to use hard woods like hickory or mesquite with beef stew meat for maximum flavor. Smoke the beef stew meat for 1 1/2 hours on the smoker and then pull it off and dump everything in the foil pan into the crock pot. Let it finish in the crock pot along with your other stew ingredients for at least another 2 hours or as long as 4.